These plants are easy to grow. As soon as the soil is warm, plant seeds near a trellis or fence, and let them go wild. Here, gourds have been coaxed to hang from horizontal supports, which ensures that their necks will grow straight. When the stems begin to change from green to yellow or brown, the fruits are ready for harvest. Fresh-gourd displays should be temporary; place waxed paper or another protective covering underneath. Gourd Lamp How-ToIt's easy to make this with a kit that is usually used for turning a bottle into a lamp; the kit is available at most hardware and crafts stores. When sawing or drilling a gourd, always wear a paper mask for safety, and work in a well-ventilated area. 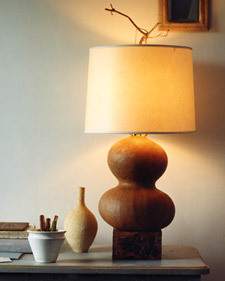 Choose a gourd with a flat bottom and a shape that goes well with your lampshade. 1. With a keyhole saw, cut off the stem and save it. With the saw, carve a hole just wider than the diameter of the light-socket base in the top of the gourd; pour in gravel or sand to weight the gourd. 2. Place a dab of hot glue along the inner edge of the hole, and push in socket. If desired, attach gourd, using wood glue, to a standard wooden lamp base, available at hardware stores, or cut a piece of wood to fit underneath the gourd (we used a handsomely weathered piece of wood as the base). 3. Next, attach stem to lamp finial with hot glue. Attach harp to sides of socket, and screw in lightbulb; place shade on top. 4. Finish by attaching self-adhesive felt pads, to prevent scratches on your tabletop, to the bottom of the gourd or lamp base. Gourd House-Number How-ToDecorated with a house number, an oval-shaped gourd stands next to two snake gourds and a caveman's club. Make or buy a stencil for the numbers, and paint them on with water-based acrylic paint. Drill holes in the back of any gourds placed outside, and pour in a bit of sand to keep them anchored on windy days.